We arrived home after a beautiful drive across the mountain from Knoxville to Asheville. The schedule changed just slightly when Judy came up with the bright idea to unload the trailer while in the cool surroundings of the campground. This we did, moving the stuff we wanted to take home into the truck, and moving a few things such as the BBQ grill from the truck into the trailer. The result was that we didn't arrive at the TT shelter until mid-afternoon, but it took only a few minutes to unhook and be off. It's been busy since we arrived back in Tryon. The house was in great shape (thanks primarily to the Thompson's, our wonderful landscape folks), but a lot of paperwork awaited. We're now over the hump; hence the final post of this chapter. Today is the 71 day of the Three T's Tour: Truck, Trailer & Terrier. It ends 'T' for tomorrow. Tonight we're in Newport, TN. It's on I-40 about half way between Knoxville, TN and Asheville, NC. It's our last stop. There's nothing interesting here -- we stopped only to break up the drive from Renfro Valley to our trailer storage place near Tryon. What with unpacking, putting away the trailer, etc. we're anxious to arrive fairly early tomorrow. It's been a great trip for the whole pack. We've had wonderful adventures, seen wonderful things and made wonderful memories. None of us want it to end, but we're already planning a Fall trip and need to get home so as not to delay the start of that odyssey. Thanks for traveling with us -- we'll see 'ya down the road. If you were raised in the north, or are very young, you probably haven't heard of the Renfro Valley Barn Dance, but I have a great memory of listening to it on the crystal set when I wuz a youngun. Soooo... on Saturday we drove down to the Renfro Valley, about 50 miles south of Lexington, to hear it live. What a hoot! It was so much fun we ended up going to three consecutive shows. 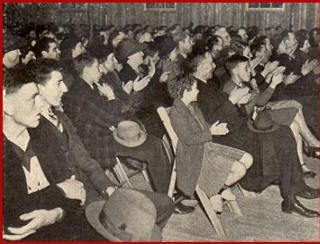 At 4:30 we went to a reenactment of a 1939 show -- the year the Barn Dance first came to the Renfro Valley. The reenactment part was lame, a few bib overalls and flour sack dresses, but the music was fabulous. Oh yes, there was one neat instrument: The pedal steel guitar player was on a vintage instrument with only one pedal. Turns out he collects and restores them. After the show we retired to our 'Star's Trailer' with just enough time for a nap and cocktails before the real Renfro Valley Barn Dance. There were nine musicians on stage, and each one was more talented than the next. Man, could they pick and sing! I'm happy to report the Old Barn was filled to capacity of about 500. I'm seventeenth from the right. Judy is to my left. We didn't want it to end, so we signed up for the 9:00 Renfro Valley Jamboree. 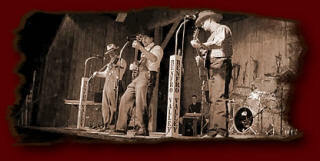 This show featured the same musicians playing a more contemporary chart of bluegrass and country music. I strongly recommend you take in one of the shows next time you're in the Renfro Valley. Last Thursday I learned the secret of sipping bourbon whiskey. It was at the Woodford Reserve distillery in Versailles, KY. I didn't breathe a word of it to the bourbon people, but their secret works equally well with -- heaven forbid -- Scotch whiskey. On June 21st I wrote about our visit to the tiny Maker's Mark distillery. Well, it's a giant next to Woodford Reserve. These are the stills. 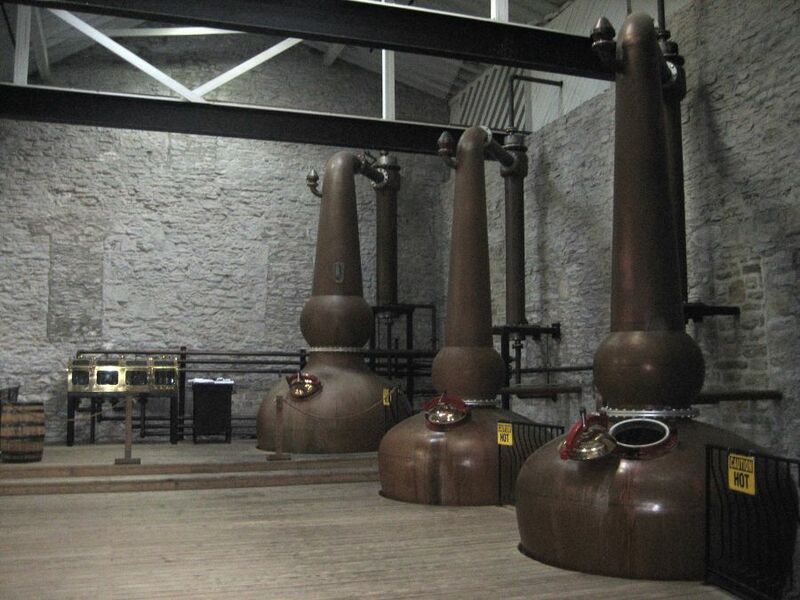 There are three pots because it's triple distilled, not because they have triple capacity. Between the stills and the brass contraption with four windows you can see a black pedestal with a white top. Cue Ebenezer Scrooge. This is an honest-to-God hand written ledger where they record temperature and hydrometer readings for the distillation as it passes through the brass contraption. Now, keep in mind that Woodford Reserve is in national distribution when you look at the next photo. This is the bottling and packaging department -- the whole thing -- and they only come in part time when there's enough bourbon ready to be bottled. Sorry about the shaky photo. I was anticipating the tasting room. Woodford is owned by a conglomerate that also owns Jack Daniels. I believe the guide told us that they produce about 500 cases a week while Jack Daniels produces about 21,000 cases a day. Oh, the sippin' secret? One ice cube in a glass of straight whiskey will explode the flavor without diluting. I'll never drink 'neat' again. After I wrote the last post Judy found this 'Gee-Whiz' information about the Kentucky Horse Park in the Lexington Visitor's Guide. KHP maintains about 28 miles of white board fencing. 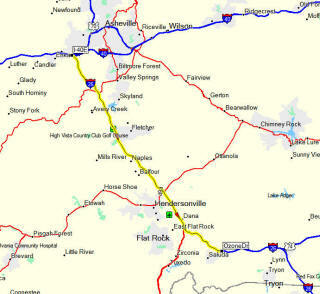 To put that much fence into local perspective, it would stretch along I-26 from I-40 to Saluda. Then there's the grass. It doesn't say anything about mowing, but weed eating around the fence takes a 10 man crew a week to complete. Figuring a 35 hour week (they're state employees, so that's undoubtedly overstated) times $10 an hour (Undoubtedly understated), times 10 men, I figure it costs at least $3,500 for 'once around,' and probably closer to twice that. Horse person or not, If you haven't visited the Kentucky Horse Park in Lexington, KY put it on the top of your list. To prostitute the old Sara Lee television commercial, "Nobody doesn't like KHP." But what's not to like about an exquisite 1,200 acre state park dedicated to horses? We tried to take photos but just couldn't get one that would both show the scale of the place, and still be close enough to see more than dots in the distance. Apparently KHP photographers have the same problem. I tried to steal a good photo from their website, but there are none. KHP works hard at being a tourist attraction and succeeds brilliantly. Our day began at 9:30 in the draft horse barn where we met teams of Percherons, Clydesdales, Norwegian Fiords and English Shires. We were particularly taken with these two beautiful Norwegian Fiords, perhaps, in part, because a Tryon friend has two. Other breeds are displayed on other days. It's a nice life; each team works only three or four days a week a few hours a day, otherwise they're in pasture. After we met the teams, the Percherons were hitched to a trolley and gave us a short ride around the main area. We went to two arena presentations after the tour. The first was a of some of the famous horses that retired to KHP. It was nicely done, with a video of career highlights for each horse and a chance to take photos with them. We saw Cigar, the richest horse in the US, and second richest in the world. I believe he was said to have won 16 consecutive races. The Parade of Breeds followed in another arena. In this presentation appropriately costumed riders paraded different breeds while the announcer told us about the breed. Sounds kinda boring the way I wrote it, but wasn't. They have some pretty obscure breeds - at least I hadn't heard of them - and that was very interesting. The park also has several museums -- one of general interest, and others breed-specific or activity-specific. We spent time in only the main one, but it was really well done, and frankly, more than non-horse people can assimilate. Having said all the above, let me correct the misconception I've created. Tourism is secondary at KHP. First, and foremost, it's an active venue for all types of horse activities. During our stay the place was awash in horse trailers and their occupants. Horse fun was happening all over the place, including a polo game (they have six polo fields). The only activity I didn't see was fox hunting. It's true. In addition to all of the arena events like show jumping, dressage, etc. they have steeplechase and three-day event courses. I even saw a horseshoe pit. Seriously, this place is so highly regarded in the equestrian world that in 2010 it will host the World Equestrian Games. The WEG are the equestrian Olympics, and like the human Olympics, are held every four years. It will be the first time they've been held in the US. We're staying at the Kentucky Horse Park Campground. Like the KHP proper, it's pretty huge. We didn't go aloft to take this, I 'lifted' it from their website. That's the trailer's home, not ours. We stopped for the night at Jackson Center, OH, where Airstream trailers are built. Tomorrow the service department will replace an uncooperative light fixture in our master bath. It's something we could replace ourselves, but Jackson Center is just off I-75 on our route south, and, hey, it's under warranty. Careful readers will recollect that we stopped here on the way north, and that I didn't find much to write about. Since we've 'been here, done that,' there's even less to write about now. One possibility is a bicycle museum we've heard is interesting. If we go, and it is, we'll let you know. We left the WBCCI rally this morning and drove about 150 miles south. That's a pretty typical day's drive for us. Our goal was the Cabela's I mentioned in the previous post. Assuming that it would be too hot to leave the Terrier in the trailer while we were in Cabela's, we originally planned to go directly to the campground and enthrone him in the trailer's air conditioned splendor while we motored back to the store. It was a beautiful day with a high temperature in the low 70's, however, so we scrubbed that plan and stopped at Cabela's before coming down to the campground, which is about 10 miles south. I regret being negative, but, truthfully, the Cabela's was disappointing. While in Louisville, KY we toured a mega Pro Bass Shop which is pretty much the same as Cabela's, but that store was newer and more awesome. Nonetheless, I was able to replace the ineffective indoor/outdoor thermometer I had purchased at Wal-Mart, so it wasn't a total waste. Tomorrow we leave Michigan. It seems so long ago I can't remember when we arrived, but our calendar says we'll have been here since July 9th. That's 42 days we'll always cherish... at least those we can remember. We're having fun at the Michigan state Wally Byam Caravan Club International rally in Saint Louis, MI. WBCCI is the Airstream owner's club. There are about 50 Airstreams here, including aluminum trailers like ours; large motorhomes that Airstream formerly built, but has discontinued; and small vans that have become popular because of their high gas mileage. This trailer is protected by a ferocious guard dog. The rally includes daytime tours of local places, some community meals, and local entertainment in the evenings, but the attraction for us is hanging out with fellow Airstreamer's. I should have said learning from fellow Airstreamer's. Some of these folks have been at it for 20 - 30 years, and are very generous in passing along their experience. It's also true that we learn from other 'newbie's' who're having many of the same tribulations. Yesterday I showed a new friend how I fixed our leaking shower. His was leaking in exactly the same place, but it's not now. We'll pack up tomorrow morning and continue south. I'm especially looking forward to the afternoon when we stop at Cabela's, a giant outdoor store that claims to be Michigan's most popular tourist destination. Sounds like a mighty big claim to me -- we'll see. At Holiday Park we spent time with Shirley and her companion, Ken Kenewell. During the winter they live in Sun City, AZ, but both are originally from Michigan, and that's where the story took the 'six degrees of separation' turn. Remember us stopping early on to visit the Fauth's in Ludington? Well, Ken grew up with Gerry Fauth and his brothers. They are all collectors of old cars, and he's still best buddies with brother, Greg. Next week they'll be in this car touring the Canadian Maritime provinces with an antique car club. Last year Ken toured Italy in the same car. If you enlarge the photo you can almost read the front license plate that commemorates that trip. The '20' is Ken's car number. P. S. This was our first time in a park catering to Airstream. As Judy observed, it's always been easy to find our aluminum trailer in the forest of white fiberglass in other parks, but not so here. There are a few SOB's (some other brand), but not many. Sixteen feet of snow during the winter of '96 - '97! That's 192 inches. It's difficult, nay, impossible, for me to imagine living here through a winter. We'd love to be here for the summer, but forget winter. It's no wonder the residents are rude to each other. I would be too. After all, it's August -- winter is just around the corner. Our web host (like all others) provides aggregate statistics regarding visits to this blog. They can't tell who's reading, only the number of views/viewers and some obscure facts such as the browser used, the viewer's ISP, etc. I've not paid any attention because I figured my mother was the only reader, and, hey, I know who she is. Today, for a murky reason (probably Scotch related), I looked. Wow! It certainly raised more questions than it answered. Namely, why were there 571 page views last Friday? We had an average of 30 page views on each of the other six days that week. Come forward and confess... who had us on automatic redial? Did Google find us? We use (and recommend) the Mozilla Firefox browser, but someone has accessed the blog sixteen times with Firefox version 1.0. For increased security you really should upgrade to version 2.
Who's using the Konqueror browser? Please write and tell me about it. Is it better than Firefox? Did you upgrade from 3.0 to 3.1? We've been read by both versions. Most readers use Windows, but last week the operating systems of twenty-eight users couldn't be determined. Since no Apple users were reported I hope our good friends with Apple computers are reading in stealth mode. Enough. I'll find something more productive to do tomorrow. We're in Traverse City, MI and today is Judy's birthday. To celebrate, her son took her to play in the park and then shopping at Petsmart where he bought her a large bucket of freeze dried liver treats. What a son! What a lucky Birthday Girl! This campground is 'mostly' Airstream. I believe they would like to be 'Airstream only,' but there's not enough business to make it work. At any rate, it's neat to look out our windows and see shiny aluminum all around. We're nothing if not flexible. Today we decided to spend another night here so that tomorrow we can attend The Les Cheneaux Islands Antique Wooden Boat Show. Notwithstanding the fancy name, this is the Hessel Show because it's in Hessel, MI. And, I might add, is the show where Renaissance won first place last year. We hope to see Trip and Alan there. It should be fun. Sunday we head back to Traverse City, and will stay there until Wednesday. I'm hoping to camp in the parking lot of the Grand Traverse Pie Company. On Wednesday we head to St. Louis, MI (that's right, Michigan) for the Michigan state Airstream rally. We met fellow Airstreamers in Munising who encouraged us to attend, and promised at least 100 others will be there. The rally will last through the weekend. After that, who knows? The RealFeel temperature in Tryon was forecast to be 105 today, but I'll need a sweatshirt to walk Casey this evening in St. Ignace. Nuf sed. 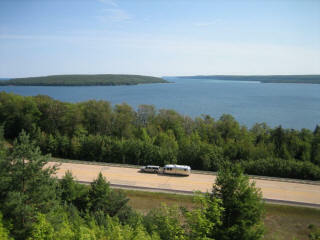 Judy took this picture en route from Munising to Marquette. It pretty much sums up our experience in the Upper Peninsular of Michigan. In the distance you can see Grand Island on the left and Pictured Rocks National Lakeshore on the right. Here's a map pinpointing the location. The photo was taken where you see the marker Photo shot here (duh!). You'll also see markers for Gitchee Gumee and Tiki. To the right of Tiki, the RV park where I'm writing this, you'll also see a green airport marker and Mackinac Island. This is the end of the line. Wednesday when we visited Marquette's Presque Isle Park it was the northernmost point of The Three T's Tour. From here it's south... though not straight home. We stayed near Marquette on the southern shore of Lake Superior were Longfellow is said to have located Song of Hiawatha. Gitche Gumee RV Park was our home. This incredible campground was built over an eight year period by a very skillful and entertaining fellow -- largely by himself. It has the look and feel of an Up Country fort. Judy took these photos, but it's difficult to appreciate the park in its entirety. After unsuccessfully chasing cool weather for 52 days we finally found it! Last night our heat pump was set to come on at 63 degrees and it did... often. This morning we awoke to a chilly 55 degrees and a predicted high for the day in the high 70's. You can see I'm dressed for cool weather, Casey is happy to be snuggled, and there are white caps behind us. The rock formation is Miners Castle. I can't find out how tall it is, but we're standing on a viewing platform that's probably 100' or more up from the water level. It's Saturday, August 5th, eight days since my last post. I've not been overwhelmed with complaints, but let me explain: The hiatus was caused by my publishing a new issue of the Pisgah Chapter of Trout Unlimited newsletter, and by really poor, or no, internet service. 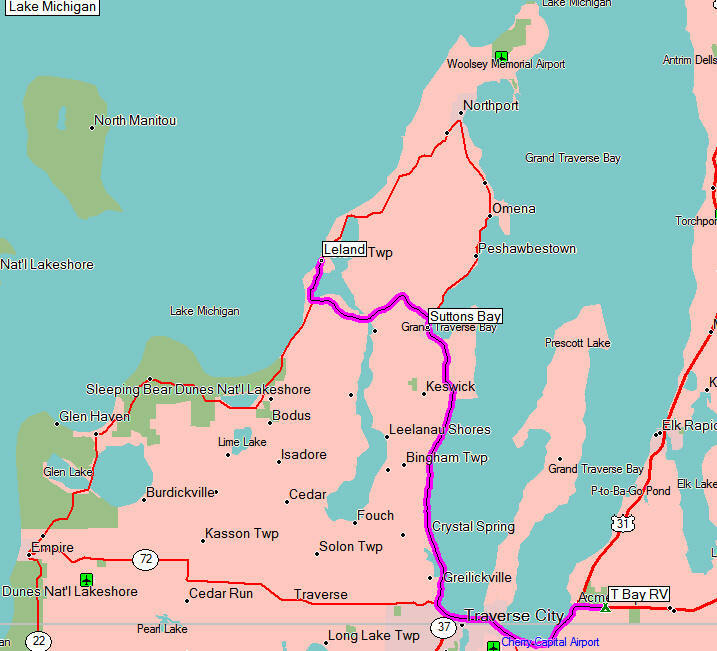 We're now in the Upper Peninsula (UP) of Michigan, where the Internet comes to die. 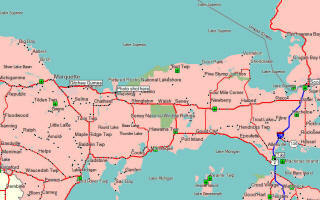 Two days ago the Internet crashed throughout the Eastern portion of the UP. You'd be forgiven for thinking, "So what, nobody lives there," but in fact, someone, or something, does... the US Border Patrol and US Customs. It was a terrible thing watching the backup of folks trying to cross the bridge into the US from Canada at Sault Sainte Marie when your federal government had no computer service. The backup was at least ten miles. Freshen your drink (the blog improves after the second -- is best read after the third) and I'll try to fill you in on all the UP excitement. Since this update, like the rest of the blog, is LIFO, you might want to skip to this first update post to begin reading and then scroll upward. Although I'm writing this on Saturday night, I know I won't have sufficient internet speed to post it from this campground. Perhaps tomorrow when we move to Munising. We stopped in Newberry, MI for access to Tahquamenon Falls, and because it's on the route to Munising, where we'll see the Pictured Rocks National Lakeshore. We've pretty much found 'the middle of nowhere.' Outdoor tourism is the draw, if you don't count the penitentiary located here -- that's more Indoor tourism. Hundreds of miles of abandoned logging trails crisscross the 40,000 acres of Tahquamenon Falls State Park. In the summer they're used for biking, hiking and ATV's. In the winter, 200" of snow attracts cross-country skiers and snowmobiles. That was not a 'writeo.' This area has an average snowfall of 16' 9", though everyone we've spoken with lamented the fact that there's been less in the last year or two. They're not being heroic -- tourism is off because of it. Terriers are permitted at the Falls, and ours had a great day. He smelled, and made a valiant effort to whizz on, everything. The Upper Falls are 50' high by 200' wide. In this photo there are people on the viewing platform at the top right of the falls. You can get a better perspective on size by clicking on the photo to enlarge it. There's also a Lower Falls, but they're really just rapids so we didn't go there. The Corps of Engineers also maintains web cams where you can watch ships locking through. Click here to see them. This is a Judy shot of a 1,013' freighter passing our campsite. Ships, normally in the 750' to 800' length range, provide us with regular entertainment. Ships of this type carry taconite (iron ore pellets), coal, grain and limestone between great lakes ports. Occasionally an ocean-going freighter will pass through the locks, but it's mainly lakes freighters. The flower gardens and landscaping are beautiful in this part of the country. Although there are none in this shot, the Hollyhocks are especially nice. They were quite prevalent on Mackinac Island. Two other tourist sites in Soo are great fun. My favorite is the museum ship Valley Camp. The Valley Camp is a 550' great lakes freighter built in 1917 and retired in 1966. It's open for stem-to-stern inspection, and looks like the crew just stepped down for a break. In addition, the hold (where cargo was carried) has been converted into a museum with more than you want to learn about great lakes shipping. It's a great place -- I loved it. Judy and I both like aviation museums, and the Canadian Bushplane Heritage Centre in Sault Sainte Marie, Ontario didn't disappoint. It's a really neat museum. There are probably several dozen historic bushplanes to inspect, and each is dramatized with a short action video and pictorial history. We played around in several of them. In addition to planes, the museum has a great number of artifacts, two movie theatres and a flight simulator. All of the museums we've visited have fully embraced multimedia and interactive hands-on displays. They're so cool, and so different than museums when we were kids. 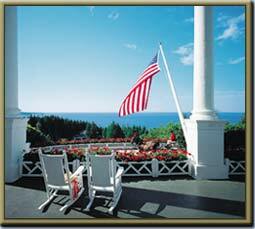 The Grand Hotel on Mackinac Island is. In fact, it's grand enough to be listed on page 629 of 1000 Places to See Before You Die. Today we sat in rocking chairs on the 660' front veranda sipping cocktails and drinking in a spectacular view of the Straits of Mackinac and the five-mile long Mackinac Bridge. The porch sitting and cocktail drinking was done only after paying a $12. per head entrance fee charged to non-hotel guests. It was worth the money. Because of the 'gawking fee,' the hotel is not troubled by riffraff like us nosing about. Certainly, there are no kids disturbing the paying guests and $12 gawkers. 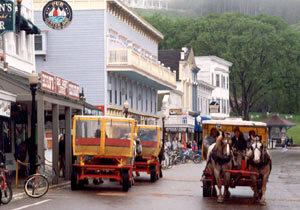 Mackinac Island permits motorized vehicles only on golf courses. Exhaust fumes are eliminated, but with 800 horses on the island, the absence of that smell isn't noticed. In addition to enjoying the hotel, we did a nice walkabout on the West Bluff, but saw little else. In retrospect, we've decided that we didn't spend enough time on the island, and plan to stop again on our way south. Today Mackinaw City retains the "aw" spelling while the bridge, straits and island steadfastly cling to the traditional "ac" spelling. No matter how it is spelled, however, it is always pronounced Mackinaw! Parks have been one of the great joys of our time on the Eastern shore of Lake Michigan. We've found absolutely beautiful public parks in every city we've visited. Most often they provide public lake access with boat launching ramps, play areas for kids, picnic areas and jogging/biking trails. Elaborate landscaping and meticulous maintenance are the norm. Casey is doing wonderfully well on the trip, and his daily (often twice-daily) park time is probably why. We can't say how much it costs Michigan residents in taxes, but it's pretty wonderful that the state has kept so much prime lakefront property open to the public. Quite different than Florida. Last evening we went out to supper in Harbor Springs with Anne-Gaëlle and Garth Morse. It was fun, but the best part of the evening for us was meeting at their rural Harbor Springs home for drinks. Here's a picture Judy took of us sitting in one of their gardens. You can see only the oldest part of the house, which, beginning with a canvas tipi, Garth and Anne-Gaëlle have built entirely by hand. The improvements they've made since our last visit seven or eight years ago are breathtaking. But then, we all know talent's a cheap trick. Today we packed up after a nice stay in Traverse City and drove about 70 miles to Petoskey. We chose Petoskey because it's central to Charlevoix and Harbor Springs, two places we want to explore. As a bonus, we'll get to visit Key West friends, the Morse's, in Harbor Springs. Will let you know if we find out who this Van Wieren fellow is. Yesterday started out nicely as we headed for Deerings Market & Deli. Deerings is a highly-revered local market that makes its own smoked meats and jerky. It's modest place, located in a nice residential/commercial neighborhood in TC, and not too difficult to find with help from the GPS. When we arrived Judy went in to shop while I helped Casey check out the neighborhood. Careful readers remember that yesterday I let the fuel level in the TV drop so low that the 'Low Fuel' light came on. At the time, the only adverse fallout seemed to be coming from the passenger seat. Oh, my. If only that was true! The truck refused to start when we finished at Deering's. Since the fuel gauge read under a quarter of a tank at the time, we reasoned that it might be faulty, and that we were truly out of fuel. I appreciate that our logic doesn't jibe with yesterday's experience of the truck running fine with the 'Low Fuel' light on, but, hey, it seemed right to try the obvious things first -- so we walked to a close-by station, bought a can and two gallons of diesel. Of course nothing happened when we added the fuel and tried again to start the truck, so Judy read the Owner's Manual. (Tim 'The Tool Man' Taylor would be disappointed that we stooped so low.) She found instructions for priming the fuel pump if you run completely out of fuel. You already know that we hadn't run completely out of fuel, but it was the closest thing she could find, so we followed the instructions. I needn't say that, again, nothing happened. It seemed like a good time to give up and call AAA, so we did. It was a good move. When we related our experience to the tow truck driver his immediate reply was, "Pop the hood, I can fix this!" We did, and he did. Judy had us on the right track, but we stopped too soon. The AAA simply pumped the manual fuel priming pump more than the Owner's Manual had instructed. His theory was that air was introduced into the fuel line when I let the tank run very low. His recommendation: "Don't do that again." We were on the road again a few minutes later with the satisfaction that, if it ever happens again, we'll be ready. Today, on a beautifully cool and overcast day, we had a fun outing at the Sleeping Bear Dunes National Lakeshore. Here's a map of the park, which is an inset of the map from the previous post. The park name comes from a sad (at least to me) fable about two bear cubs that drowned themselves in the lake and their mother that sleeps on the dunes awaiting their return. 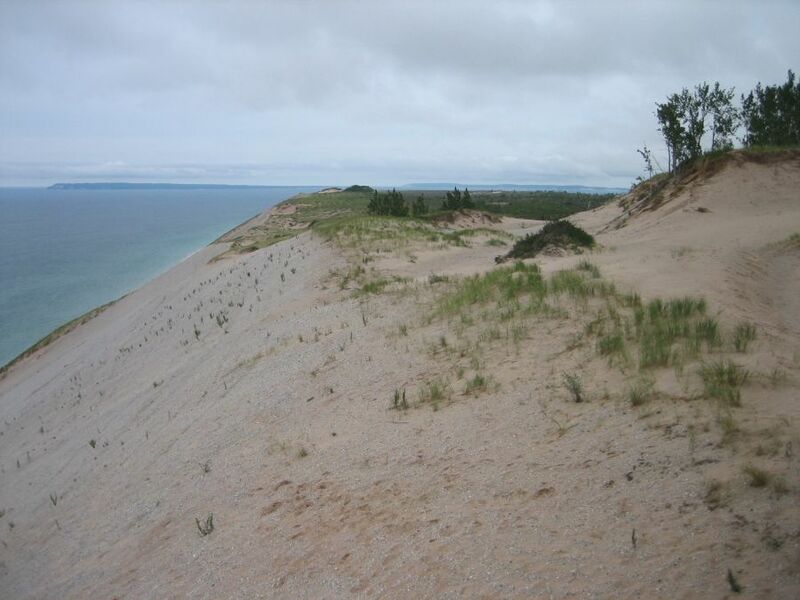 The cubs are represented by the Manitou Islands, and the mother is represented by a certain dune on the point that's closest to the Manitou's. A less romantic explanation is that the islands, and all of this part of the Lake Michigan shoreline, were formed when receding glaciers left sand deposits that formed huge dunes. Here's an amazing shot. 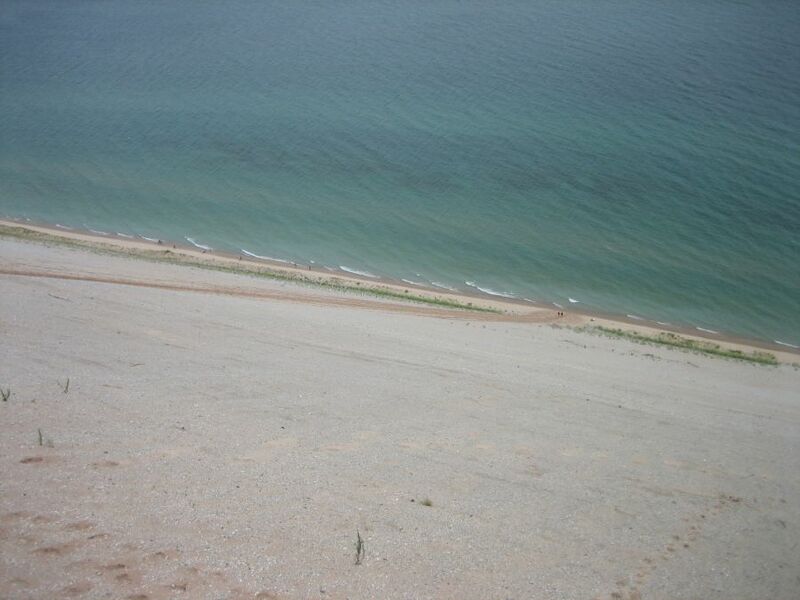 The dune is 450 feet above the lake. 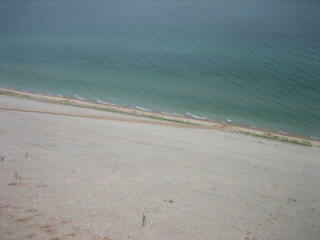 Those specks at the bottom are people who have descended straight down the dune. Ascending is considerably more difficult -- it requires crawling up on all fours. We noted a rescue apparatus at the top. You'll need to enlarge this to see people at the bottom. One last candid. I think this is such a cute shot of Judy. Casey looks grumpy, but in fact, he had a ball today. We got home about four o'clock and he slept soundly until supper at seven. The whole pack had fun today, but some would have had more if I hadn't let the 'Low Fuel' light come on in the truck when we were in the middle of nowhere. Sorta took the edge off. Yesterday we drove 20 miles northwest (from our campground 'T Bay RV') to check out two neat little towns: Suttons Bay and Leland. The town of Leland is upscale and impressive. 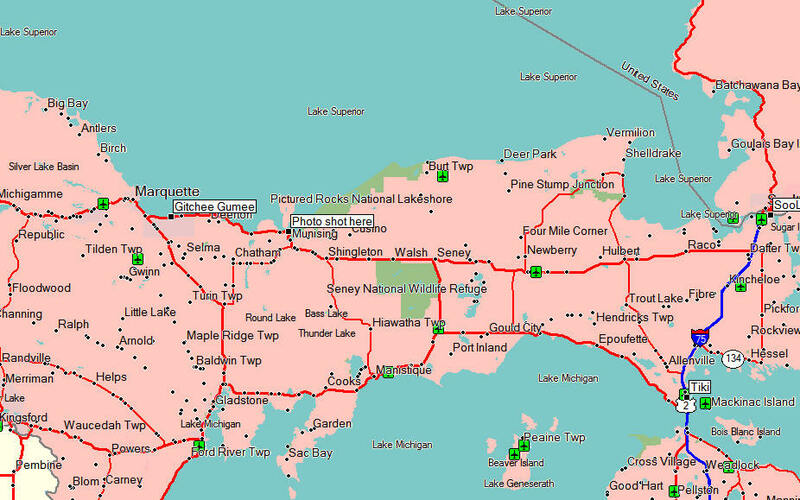 On the above map you can see that it's sandwiched between Lake Michigan and the very large Lake Leelanau. This means there's a lot of waterfront property, and the thing we like -- rustic little cottages that haven't been scraped and replaced by McMansions. They have both a yacht club and a country club. Judy indexes a population by the local grocery -- especially its offering of meat and prepared foods. The Leland Mercantile passed with flying colors. We brought back a cooler full of nice stuff. In Leland we found tiny Fishtown, a 100 year old fishing village that feels like a Midwestern Cannery Row. Today it's primarily a cute tourist destination but there's a cheese and a fish shop that are good enough to satisfy locals. I must confess a mistake. Recently I wrote that Trip and Alan's boat, Renaissance, is a beautifully restored twenty-two foot Chris Craft triple cockpit. It's not. Renaissance is a beautifully restored twenty-three foot Chris Craft triple cockpit. I can't imagine it would be any less beautiful if a foot shorter, but you deserve accuracy and a foot is a foot. This blog sincerely and humbly regrets the error. 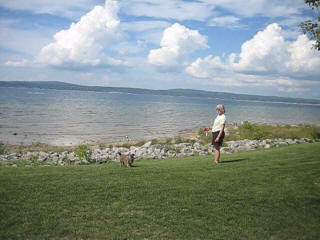 Our first day in Traverse City (locally known as TC) was great! This morning Mr. C. slept in while Judy and I 'did' downtown and had a fine lunch at the Mackinaw Brew Pub. After lunch we picked up the Terrier and headed up Old Mission Peninsula that separates Grand Traverse Bay into the East Bay and the West Bay. This is sweet cherry country. We passed cherry orchard after cherry orchard, broken only occasionally by grape vineyards supplying the peninsula's wineries. Cherries are available everywhere, and in every form from fresh fruit to wine, pie, pastries and chutney; and every one of them is wonderful. At the top end of the peninsula is the Old Mission Lighthouse. The picturesque lighthouse, no longer in use, was commissioned in 1870. Our pack voted two to one that we don't do the other half -- Some people (and dogs) have no sense of adventure. Driving back along Bluff Road we could easily visualize spending summers here when we're finished traveling. Are we in Sahara, MI? We came to Mears, MI on the 13th because we wanted to visit our friends, the Fauth's, in Ludington, MI but couldn't get a campsite there. 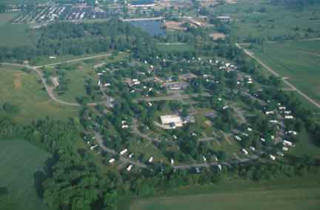 This is about 30 miles south, and is a major camping area for folks visiting Silver Lake State Park. 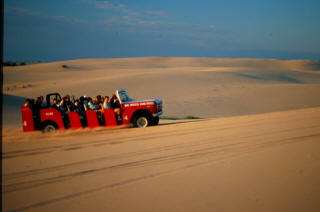 The attraction here are mammoth sand dunes that are available to vehicles. 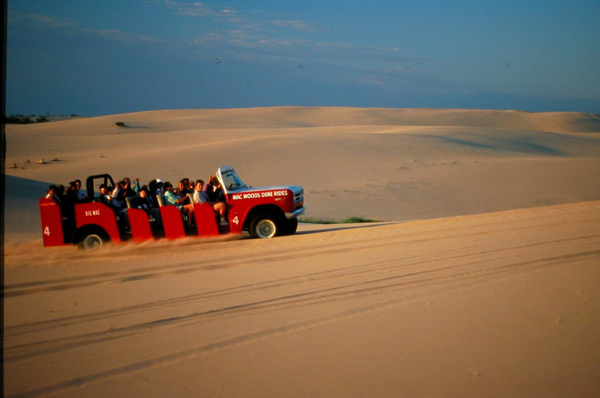 Seeing people cavorting about on the dunes in Off Road Vehicles is a shock to us since you're barely allowed to look at the dunes in Florida. This is a tour bus. There are also many types of private vehicles. Because of our disappointment finding space in Ludington, and knowing that we're entering an even more popular vacation area, we've made advance campground reservations for the next week or so. Today we moved to Travers City, MI. where we'll spend a few days poking about. 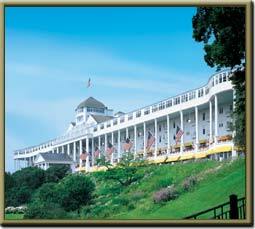 After that we move to Petoskey, MI for several days, and then to St. Ignace, MI where we'll stay while visiting Mackinac Island. That will take us to August. We'll let you know what we find. We spent the past few days in Saugatuck, MI playing with our friends, Trip and Alan. It was great fun, and not the tiniest bit 'Educational.' We ate at great restaurants, explored the town, saw beautiful homes and cruised Kalamazoo Lake in Renaissance, the most beautiful boat I've ever been in. Is anyone having fun in this picture? Renaissance is a 1942 Chris Craft 22' triple cockpit. She recently won the top prize at a national antique boat show. It's no surprise -- she's absolutely smashing, with incredible attention to detail. I don't have a good profile shot since we were all in the boat, but this shot of Alan at the helm may give you a sense of how gorgeous she is. Believe it or not, Trip and Alan are still improving Renaissance. It won't be long before she's Best-of-Show at Lake Tahoe. Our Guardian Angel never disappoints. Leaving Jackson Center, OH we headed toward Saugatuck, MI but wanted to break the trip into two days. A campground just off Interstate 80 in Middlebury, IN looked convenient so we stopped. What we didn't realize is that we were only 8.7 miles from Shipshewana. That's right, Our GA put us next door to the Shipshewana featured on page 629 of 1000 Places to See Before You Die. The big deal is that this is the epicenter of Amish/Mennonites in the US. In fact, Goshen, IN just down the road was their first US settlement. Today there is a combined population of about 17,000 in the area. We didn't see Mennonite women wearing bonnets, so they are indistinguishable from us, but the Amish seem to be everywhere. The highlight of our brief stay was a visit to the Menno-Hof Interpretive Center. The Menno-Hof is a not-for-profit cooperative effort by the Amish and Mennonite churches to present their lifestyle and beliefs. We were particularly interested in the Mennonites because of their presence in the Tryon area (Judy's cleaning woman and all of the contractors on our first renovation are Mennonites), and we wondered how they relate to the Amish. Now we know, thanks to a very knowledgeable Mennonite gentlemen who guided us through the Center and answered all of our questions. When I hear an experience described as 'Educational' I immediately think 'Boring,' but at least in this case, we both learned, and had a great time. An interesting tidbit regarding Amish horses: Draft horses used for field work are bred by the Amish, but not those used to pull buggies. Buggy horses are retired harness race horses. We'll come back to Shipshewana because our schedule didn't permit nearly enough time here. Thanks Guardian Angel. From Louisville we went to the Airstream factory in Jackson Center, OH where our trailer was built. While there we had them fix the gadget that tells us when the waste tank is full. Wasn't a big deal -- turned out that the connector hadn't been securely fastened. We also had a great factory tour. I was disappointed when told that the factory was closed for the Independence Day holiday, but it turned out to be a blessing because we could go into areas that are normally off limits and see things we couldn't if workers were present. I wish we had more information about them, but this much we do know: The second from the left is a 1962 Bambi. The 'gold' one to it's right was Wally Byam's. The one at the far end is a 1937 model. Wally Byam was the founder of the Airstream company, though not the inventor of the streamlined aluminum trailer (that was Hawley Bowlus). It's been said that he was the Henry Ford of the Airstream trailer, "Ford didn't invent the car; he popularized it." Here's a better shot of the trailer he used to lead caravans around the world. I've never read why it's gold colored, but I have read he was an egotist, and that seems like a pretty good explanation. We're on the 17th day of The Three T's Tour: Truck, Trailer and Terrier and this is my first post to the blog. The tardiness is because I've spent what would have been blogging time producing the Pisgah Chapter of Trout Unlimited newsletter. Now that it's in the can (but hadn't been posted to the web site when I wrote this), I hope to keep our blog up to date. Thanks to Judy's faithful diary, I can tell you a bit about what's happened thus far: The trip began on Sunday, June 18th when we pulled out of the TT storage shed at the crack of 11:00 a.m. Of course anyone would be feeling peckish by then, and not wanting to push ourselves too hard, we towed a grueling 15 miles to the I-26 rest stop just south of Columbus, NC for a leisurely picnic lunch. One could almost see our house in Tryon from the picnic area. Of course we were embarrassed to look. In its first real test, the truck towed us up the I-26 Saluda Grade without breathing hard. It's a great truck. That first night we stopped at the Knoxville (TN) East KOA. We had made reservations, which was a good thing. The Honda Hoot was to begin on the 20th, and the place was already crawling with Honda motorcycle riders. I must say it was comical to see scruffy guys and gals posing as 'badass' in black and chains while riding Honda tricycles. The next day we stopped in Corbin, KY, where Colonel Sanders began Kentucky Fried Chicken. We tried to have lunch there but they were out of chicken! Go figure. Judy fixed a great salad for us to eat in their parking lot. In addition to a conventional KFC, the building in this photo has a very interesting museum that details Sander's business life. Of course they put a positive spin on it, but I came away with great respect for his promotion savvy and tenacity in the face of adversity. He had a lot of false starts but, when faced with a seemingly insurmountable obstacle, would bounce off and reapply himself in a different direction. After lunch we went on to Harrodsburg, KY where we stayed in Chimney Rock RV Park, a very nice campground on Lake Herrington. Thanks to Judy's exhaustive pre-trip research we spent a wonderful day at the Shaker Village of Pleasant Hill. This is the largest and best restored Shaker community in the country. We didn't take photos, but I found these on the web, and recommend you look at the slide show. They're better than those on the official web site although it's nicely done and worth a visit. The Pleasant Hill Shaker community existed for most of the 1800's: thriving during the first half, and declining during the second. Unlike the Amish, the Shakers fully embraced technology, and were innovators during their heyday. Their constant goal was to reduce the need for manual labor through the application of technology. I don't believe it was, but 'Work smarter, not harder' could have been their mantra. According to the docents, it was the Shaker's instance on absolute perfection in the goods they sold, not celibacy, that caused their downfall (the civil war also contributed). After about 1850 the Shakers high price handmade goods just couldn't compete with low cost machine goods made possible by the Industrial Revolution. Everything collapsed when they lost their economic base. We had lunch in the Dining Room. It was all very good, but the thing that had Judy clamoring to buy a cookbook was the lemon pie we had for dessert. It was (is, I hope) made with whole lemons thinly sliced, which gives it a tartness that's delightful. The next day we moved to Bardstown, KY and stayed at the My Old Kentucky Home State Park Campground. We chose it because of its proximity to the Maker's Mark Distillery, where we went for a tour. If you've had Maker's Mark Bourbon you know that the top is sealed with red wax. During the tour we had an opportunity (obligation?) to dip a souvenir bottle. Here's Judy dipping hers under the docent's close supervision . And here's a shot of the finished products. Mine's the one on the right with the wax is running down over the label. Oh, well. The distillery is privately owned and a beautiful site. It's quite remote because it must be located near a limestone-fed spring - bourbon's most important ingredient. The buildings and grounds are very tasteful. The docent credited the owner's wife with the good taste. My fascination was with the lack of employees. It doesn't take many people to make great bourbon. Must be profitable in the extreme. Now, while Scotch Whiskey is my drink of choice, Maker's Mark has been my bourbon of choice for many years -- there's an open bottle in our cabinet even as you read this. But MM tumbled from the top shelf that night when we visited The Old Talbott Tavern and I tasted Woodford Reserve. Man, that's fine bourbon. On to Owensboro, KY for the wedding of my cousin's son. He's a good lad and we enjoyed our brief encounter with his new wife. To be close to the festivities we moved into Diamond Lake Resort and found the most unusual campground we've experienced. Here's the skinny: Diamond Lake was built in the late 50's by a Kentucky fellow who had made a fortune in oil and wanted to impress his Las Vegas gambling buddies. He bought an abandoned strip mine of 500+ acres and proceeded to build a large (by 50's standards) pleasure park. It included a large restaurant and two cafes, motel, fishing lakes,10 large aquaculture ponds, 270 site campground, swimming pool, numerous picnic pavilions, two go-kart tracks, laundry, convenience store, live theatre, and, perhaps, other comforts no longer spoken of. Man, I wish I could have seen it in it's prime. According to the present owner, it's gone broke nine times and is now only about half the acreage. Most of the campsites seem to be in use, which makes it a large campground, but the large restaurant, one cafe, theatre and fish farm are closed. It's a bit sad when you reflect on what it had been, but the remaining campground is very satisfactory, and we enjoyed our stay. We're now at the Louisville Metro KOA, which is actually located across the Ohio River in Clarksville, IN. under the world's second-largest clock. We came to see Louisville, and to lay low. Nine days is longer than we would ideally like, but didn't want to be on the road looking for a campsite over the Independence Day holiday. 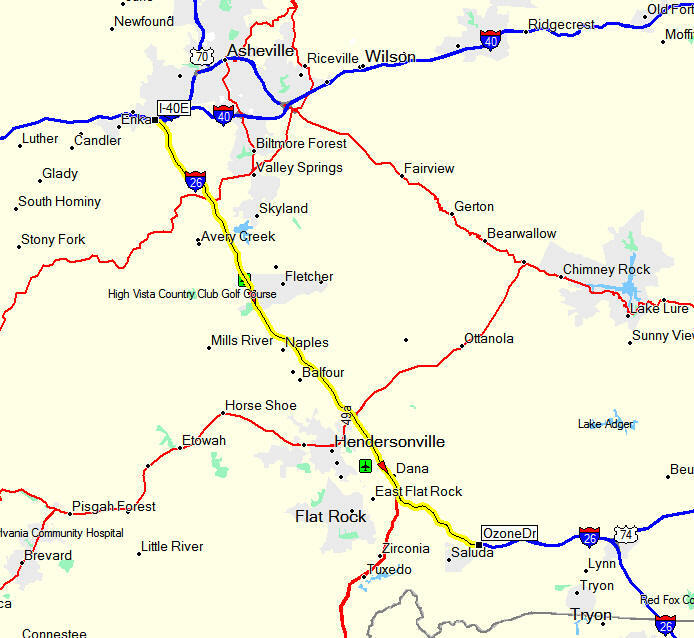 Our excursions around the area have been fun. Early on we had lunch at Proof on Main, a really great restaurant recommended by our friends Trip and Alan, who were here last week. Proof is located in the 21C Museum Hotel, which is so cool it's hard to describe. Don't envision a museum with static painting lining the walls. This is multimedia art that rocks! Check out the red penguins on the web site. In addition to the lobby herd, they're sentries on a second story ledge surrounding the building. Even the men's room is a trip. I'll try to relate my experience with sensitivity, but apologize in advance if I miss. Stepping up to a full-length urinal that stretches along one wall, I was impressed by the waterfall in front of me that serves as a continuous flush. Looking through the cascade, I saw the hall I've just left upon entering this room. That's when I realized that the 'wall' is actually dark glass. Visibility is obscured by the sheet of water, but it's nonetheless a window. To my horror, two events simultaneously occurred as I stood there minding my own business: First, a girl walked up to the wall and peered in. 'Not a problem,' I thought. 'The waterfall obscures me...' then the water stopped. True story. Another day we had luncheon while cruising the Ohio River on a 200' stern wheeler, the Belle of Louisville. 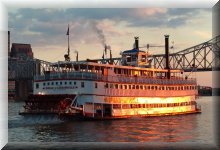 Built in 1914, the Belle is the oldest operating river steamboat in the world, and a National Historic Landmark. As you can see in this photo, it's a big boat, carrying up to 800 passengers. There wasn't much river traffic to watch because the McAlpine Locks downriver from Louisville is under renovation, but I was fascinated with the steam propulsion apparatus. It's so simple, and transparently reliable. A visit to Louisville is incomplete without seeing Churchill Downs, home of the Kentucky Derby -- so off we went. More properly, I should say off we went to the Kentucky Derby Museum. In addition to wandering through the museum and having lunch at the Derby Cafe, we had a guided tour through Churchill Downs. It was a fun time. 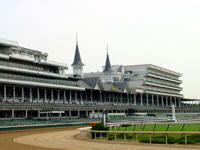 If you've watched the Kentucky Derby on television you've see the twin spire grandstand that symbolizes the derby. I wanted to see it and did... but just barely. As the next photo shows, the iconic old grandstand, which is on the National Registry of Historic Places, is being eaten by luxury boxes. Woodford Reserve is the official bourbon of Churchill Downs -- all is forgiven. Before leaving the track, here's a cocktail party tip: locals without commercial incentive won't be caught dead at the Derby. They turn out the day before for the Kentucky Oaks. ("We were, just, well, you know, too, after the Oaks.") This is an important race for fillies, which partially explains why a filly so rarely wins the Derby. We assumed he simply enjoyed looking at Louisville, but after almost a week of this, today he carelessly left the binoculars focused and when Judy glanced through them she saw a white Poodle sunbathing on a penthouse patio without her collar! Geez,what's a parent to do? Tomorrow we leave for Jackson Center, OH, for an Airstream factory tour. The weather forecast is for high 70's. It'll be a nice break from the 90's we've had here.